The national holiday had arrived and so by Saturday 3rd October I was flying, with my fellow Teach English In China friend Pri, to Hong Kong. 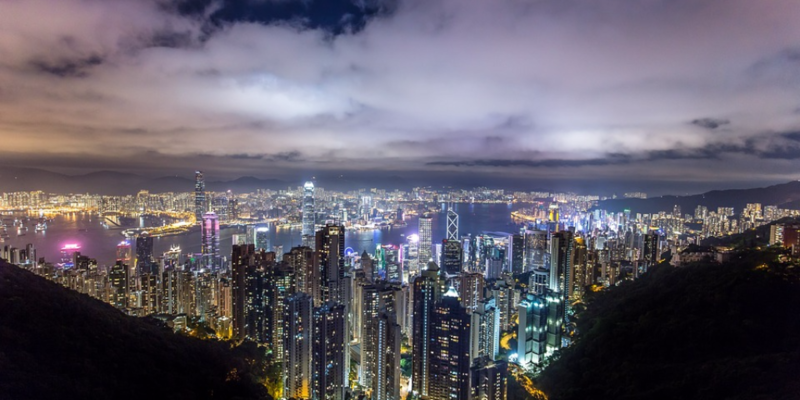 I’d heard a lot about Hong Kong and had been highly recommended to visit. The most interesting thing I read about Hong Kong before I went was that if a baby is born in Hong Kong it is entitled to citizenship regardless of where its parents are from. Therefore there has been a high amount of Chinese pregnant mothers coming to Hong Kong, and so to prevent this anyone who looks pregnant is treated with high suspicion. Anyone who appears pregnant is rumoured to be sent back! This may have been an exaggerated tale but I was intrigued. Thus the national holiday granted me the precious time to visit this captivating place, Hong Kong. Our flight was scheduled for 9:10pm from Pudong International Airport to Hong Kong. Hong Kong has its own currency, the Hong Kong dollar, and so at the airport we exchanged some RMB to Hong Kong dollar. However, I would highly recommend that you exchange money in Hong Kong, and not the airport, as the exchange rate is significantly better. 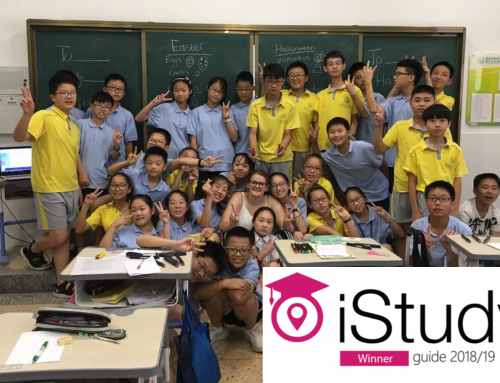 Moreover, the nature of teaching English in China promotes a lifestyle in which you constantly meet new people. I love it! 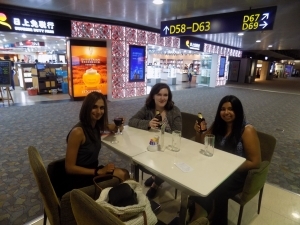 So at the airport, we met up with our fellow Teach English In China friend Golnaz’s roommate in Suzhou, Geena, who was also flying to Hong Kong on the same flight as us. We all enjoyed a meal of KFC and a cheeky drink. I had a glass of red wine, whilst Geena and Pri enjoyed a cold Chinese beer. Life felt amazing in that moment, waiting for a flight to see a whole new place. I knew it would be totally different to Mainland China. What is also great is the cost at which Pri and I got this flight, booking just two weeks before; it was £62 which is around 620RMB. We even got drinks, such as beer, juice, tea and a meal on the flight included in this price! Due to a Typhoon hitting the area, weather across China was rather disappointing during the national holiday in most parts of China, including Hong Kong. Though it was foggy and sometimes rainy, it was still hot. Also, Pri and I found a mysterious liking for the fog. Anyway, due to the weather conditions our flight was slightly delayed. We arrived into Hong Kong at around 12:30am. 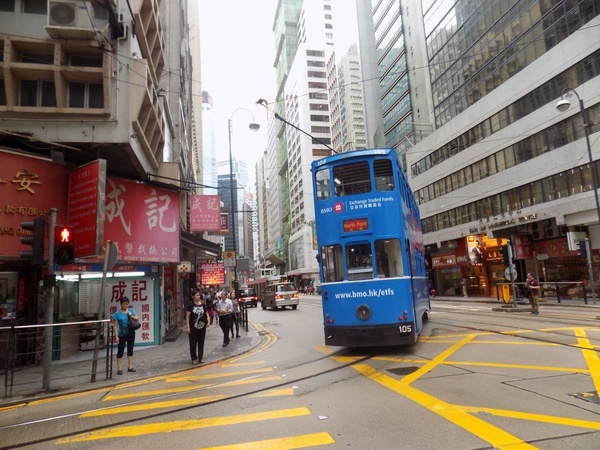 We planned to get the bus from the airport to Kowloon where we would be staying at a Hostel named City Plus Hostel, very near to the well-know Nathan Road. The bus took longer than expected, with quite a lengthy queue. Eventually we got on the bus, but at this point we were very tired as it was very late. We guessed which stop it was, and guessed well, as we got off at Nathan Road and walked to the lovely Hostel by 3am. The City Plus Hostel was clean, cute, cosy and nice. I will definitely use this hostel again when returning and would strongly recommend it to all. Significantly, its location was amazing right by Nathan Road, and next to a metro station. Due to our delays we arrived at the hostel very late. We felt bad that we had to wake up the lady in charge from her sleep. Even though this was the case, she was so warm and welcoming to us. This is the point where we noticed the first significant difference between China and Hong Kong. Everyone, pretty much, can speak English. Her English was magnificent! Anyway, she took us to our room. It was very small but very convenient. We had a double bed, a shower, complimentary water, slippers, a TV and working air-conditioning. The next morning, after very few hours sleep, in excitement we got ready to explore Hong Kong. We had roughly planned a list of what we wanted to do and see whilst in Hong Kong. 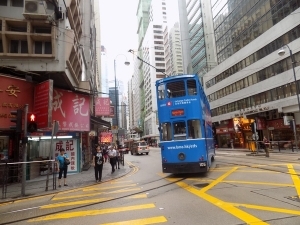 The list was exactly as follows; star ferry (get on at Tsim Sha Tsui), Victoria Peak (Peak Tram Lower Terminus on Garden Road, bus 15c by Central Pier or MTR Central Station Exit J2), Shek O Beach, Temple Street Night Market, Antiques on Hollywood Road, Ladies Market in Mongkok, Lan Kwai Fong (party/bar area), Yuen Po Street Bird Garden (7am-8pm), Stanley Market, curry at Chungking Mansion’s (Tsim Sha Tsui), Ozone – Hong Kong’s tallest building at the Ritz Carlton ( 1 Austin Road West, Kowloon), Jumbo Floating Restaurant (Sham Wan Pier Drive, Wong Chuk Hang, Aberdeen), Causeway Bay (Times Square), Tsim Sha Tsui – giant world bazaar & glittering harbour (a short walk to Canton Road – famous for shopping), Tian Tan Buddha and last but not least on our least was Nan Liam Garden. We didn’t technically do everything on this list, but considering we had two full days in Hong Kong we did a lot! Hong Kong is quite small so a few days can definitely be a fulfilling visit. Anyway, Pri prompted us to spontaneously jump on a bus as she recognised the destination on it was somewhere on our list! Thrillingly, we did. We arrived towards the Star Ferry and were amazed. We were right by the water, and could see the skyline of Hong Kong Island whilst we were on the Kowloon side. I was so excited to see the evening view of all of this. We took a wander down embracing the views, and then took the star ferry across to the other side! It was cheap at just 2HKD which is just 20pence. It was a short but fun ride across, building us up as we had not yet seen the other side of the river. We arrived and it seemed to be the Pudong equivalent in Shanghai, where all the important buildings were, a London-eye similar wheel and tall buildings. It was magnificent. Hong Kong already had so much character to me, was completely different to China and so easy to get around as it was, in contrast to China and even Shanghai, very small! We decided to grab the metro to Wan Chai. At this point, both Pri and I were quite hungry so, we decided to grab a sandwich from a shop in the metro station. Having been out here for almost two months at that point, it was the best feeling ever to be able to buy a ploughman’s cheese sandwich to eat which tasted just as it would in England! It was admittedly quite expensive, maybe M&S prices, but delightful! We arrived at our destination at Wan Chai, and it was astounding. The area had so much character and I couldn’t help but take millions of photos. It was a buzzing bar/restaurant area. We wandered round, and then saw a nice English looking bar, with lots of books and a relaxing atmosphere. Cheekily, we decided, as we were on holiday, we’d have an afternoon glass of white wine! White wine has proven very difficult to attain in Mainland China for me – even in Shanghai. Though it is available, it is not half as easy or cheap to get as in England. So it was absolutely DIVINE to sit down reading English magazines, newspapers and books with a crisp glass of white wine. We made friends with an older couple sat near us as well, who were finishing the last leg of their travels in Hong Kong. Pri and I had already roughly decided that the next day (Monday) we would wake early and visit the Tian Tan Buddha located at Ngong Ping in Hong Kong. The couple inspired us and confirmed we would definitely make this trip the next morning! After enduring our glass of wine we decided to walk down towards a historical wall the couple described to us. Though we did not quite find this on our journey we did have a nice wander and then decided to get the bus to Causeway Bay! It was a cheapish journey (not as cheap as mainland China) at around 60pence. Upon arrival at Causeway Bay I was astounded, it was like a mini New York and London style buzzing place! 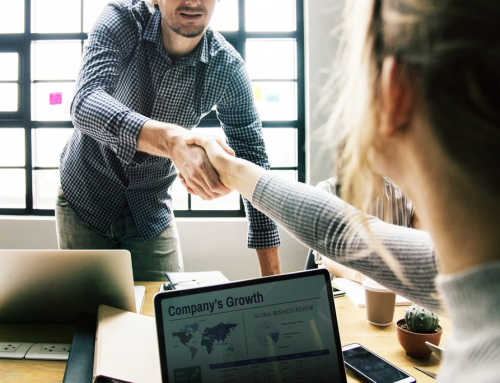 Hong Kong is renowned for its shopping, for instance due to its real imported English goods people travel to Hong Kong to buy the latest iphone, English branded nappies, medical supplies, sun cream, mosquito repellent, tampons etc. It was a buzzing shopping area with all the big stores such as Forever 21, Gucci, Topshop, and even had a Times Square! The buildings were all high-rise, lit up and awesome. It was raining slightly at this point but we got our cute umbrellas out and embraced it! It was also interesting to see English named streets everywhere. Britain’s past influence on Hong Kong is very apparent. I found that Hong Kong was literally like what a combination of China and English would be, for instance in the metro station spitting is condemned, hygiene embraced unlike China and the general culture is more liberal with women openly smoking. This is more taboo in mainland China. 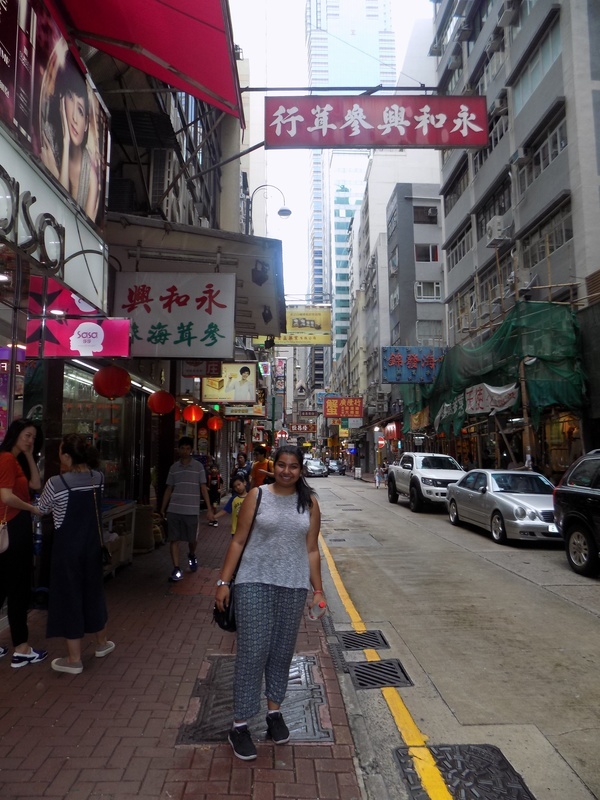 After a fun-packed day we headed back to our hostel in Kowloon near to Nathan Road to get ready for the evening! We had planned to meet back up with our friend Geena, who we had met at the airport at the beginning, and go to an Indian restaurant for dinner. Both Pri and I have Indian heritage, and we missed our Indian cuisine very much – we were very excited for this dinner! The restaurant was located at the Tsim Sha Tsui metro station stop. The name of the restaurant was Chungking Mansions and I was absolutely buzzing to be, at this point, about to embark on my first Indian meal since being in China – practically two months in! We ordered popadoms, saag chicken and paneer with naan. It was lovely, of course it was incomparable with my mother and grandmother’s Indian cooking from back home, and great to have a taste of home and India! Following dinner, we decided to take the short walk down to the Kowloon Island side of the view, and see the evening, lit up view! Pri and I had, excitedly, been there earlier during the day and were eager to see the night view. As we walked gradually closer to it, I was absolutely stunned. It was an amazing, beautifully lit up view, and I genuinely loved it more than the Pudong view of the Pearl Tower in Shanghai. It was such a warm, misty evening and with boats floating by I couldn’t get my eyes off the phenomenal skyline in front of me. Many people were sat right on the edge of the view leaning back on the rails, so we decided to join everyone else. We sat there absorbing our surroundings (after taking many photos) and I reflected on how amazing Hong Kong had been so far. I was excited for the next day and in the distance I could see roughly where the Victoria Peak was, which we would be visiting the next day after the Tian Tan Buddha – in the evening! To finish off the evening, we decided to go to the Ritz, the Ozone floor in which was the tallest building in Hong Kong. Amazingly, we were prepared to get a cab but a friendly man directed us in the right direction towards the Ritz so we got an awesome view of some very posh, designer, lit-up shops on our way. We decided to get a short cab ride to the Ritz and the ride was phenomenal, it literally went so high up a hill and when we got out the taxi the view was INSANE. I felt like I was on top of Hong Kong. The photos don’t do it any justice! Anyway, this was pretty much the best part of the evening as we got to Ozone and found that, due to the Typhoon and bad weather conditions, the outside area was closed which was the best part due to the phenomenal views. Due to this, rather than spend loads of money on a drink we decided to get a cab to the metro and go to Lan Kwai Fang which was a buzzing, recommendable, bar area, probably the equivalent of YongKang Lu (road) in Shanghai. It was a lively area with bars, music and people drinking indoors and outdoors. We decided, after quite but not massively an expensive day, to grab beers (Tsingtao) from the shop and drink outside as it was warm and a great atmosphere! Within minutes we had made friends with Americans, Canadians and Australian guys! 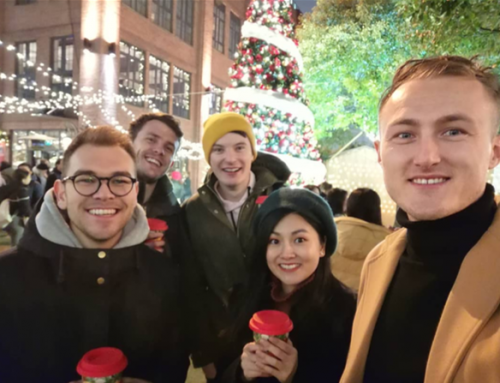 Whilst being out in China, Shanghai, Hong Kong and every part of China I have visited the BEST part has been the diversity of people you meet – it’s amazing! 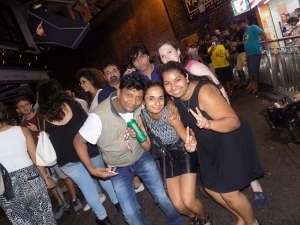 Reiterating my point is the fact that just moments later, we became friends with a bunch of friendly, funny Indian guys! We had a laugh; it was quite nice to hear the Indian accent after so long! After this fun evening, we all got the bus home, Geena to Causeway Bay and Pri and I to Kowloon. We woke up early the next morning in excitement to visit the Tian Tan Buddha. We knew we would have a somewhat spiritual and calming experience venturing further out in Hong Kong. So we got the metro to Tung Chung Station. The typhoon had been causing strong winds and rain across China at this time, including Hong Kong. We were slightly concerned about this, but all it meant was that we were unable to get the cable cart up to the top, and instead drove on the bus. I think both experiences would have been amazing, as we saw many views on the way up, beautiful villa like apartments, lakes and houses. When we reached the top there was a whole village to explore consisting of a temple and a beautiful footpath. It started to rain heavily when we got off the bus but this didn’t dishearten us or anyone else around us, we bought colourful, waterproof rain coats to wear on top of our clothes. The moment I saw the Buddha in the distance tucked away, I felt revitalised, peaceful and excited. The whole area was beautiful. Stood at the bottom of the stairs looking up to the Buddha was astounding. It almost felt like I was about to have a journey climbing the steps and reaching the Buddha. It felt like my whole China experience so far has been a journey with me more than anything, and so this moment was like a moment to climb, reflect, relax, be at peace and appreciate how lucky I am. Pri and I gradually reached the top, and we lit an incense stick half way up in respect for this beautiful religious place. We wandered around the Buddha relaxingly, absorbing the moment and the beautiful views and surroundings. On my way back down I stopped to do a prayer. I’m not a very religious person at all, but I felt this desire to pray. It was a beautiful moment. Pri and I then explored the surrounding village, the temple was beautiful and we also stopped for some food here. We went to a souvenir type shop and bought various items such as beautifully decorated incense sticks. I still have some today which I light and when it burns I think of my amazing trip to Hong Kong. As a matching souvenir we bought very cute, pink, laughing Buddha ornaments for good luck! It had been a beautiful, spiritual and refreshing day. We popped to the hostel for a quick shower, freshen up and outfit change for our evening at the Victoria Peak. We arrived at the queue for the tram up to the Victoria Peak. It was a fifteen minute wait, but what was great was that we made a friend in the queue. Fiona was Chinese, from Beijing, travelling alone to Hong Kong. I found this inspirational and we clicked and became friends pretty quickly! She joined us on the tram and we chatted away. It was clear we were going very high up a very steep hill, as the tram was practically vertical as we went up – it was insanely exciting! We saw the amazing views of Hong Kong all lit up. 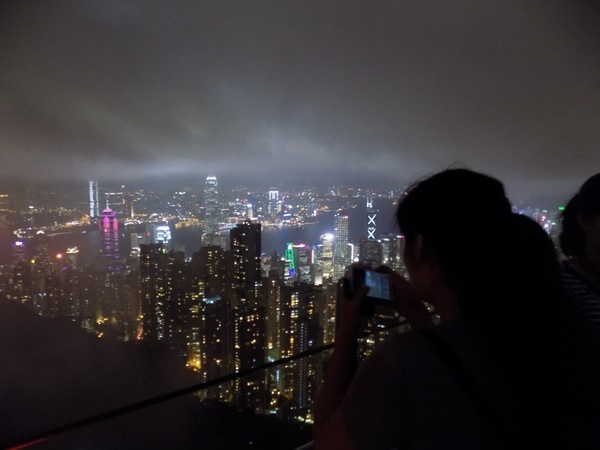 At the top, though the typhoon meant that the weather was windy, rainy and foggy, it was still absolutely incredible to see the whole city of Hong Kong. The buildings were amazingly lit up, I felt like I was on top of Hong Kong. We got some photos, embraced the views and then heading back down to find somewhere to eat dinner! Fiona, Pri and I went to The Peak Lookout restaurant, which was a restaurant which served all sorts of cuisine – including Indian cuisine! It was a cute, cosy, posh restaurant located with awesome surrounding views of Hong Kong. Fiona and I ordered a chicken Vindaloo with rice and Pri had a delicious burger and fries. Especially compared to the Indian restaurant from the day before, my dinner was DIVINE. It wasn’t as spicy as it would be at home but the sauce was a lovely thick paste, tender chicken and great Indian spicy tastes. 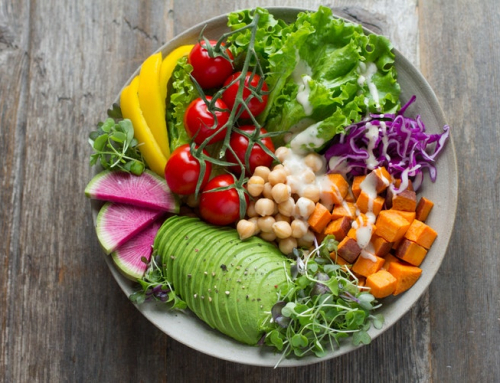 It was a perfect dinner. To finish off our Hong Kong trip, as we would be leaving very early the next morning, we decided to head to Lan Kwai Fang bar area and have a few drinks before heading home. We stopped off at a vibrant, buzzing bar that had a salsa night going on! I have never had so much fun, and this evening genuinely inspired me to find a salsa class in Shanghai! We had a beer, admittedly a very expensive beer as Hong Kong is definitely not a cheap trip, and watched people dance. I was absorbed, it was so mesmerising watching girls and boys move together to the music so beautifully. Many men passed by asking us to dance, in which Fiona dived in and gave it a go! 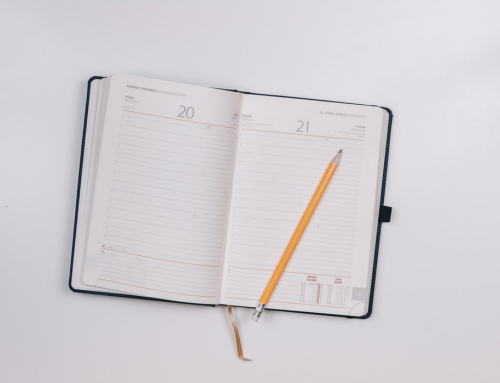 The DJ asked me to dance and I found myself on my feet dancing – I was nowhere near as good as anyone else but I was learning the steps and enjoyed myself greatly! After a good old laugh, dance and fun we decided to head home. 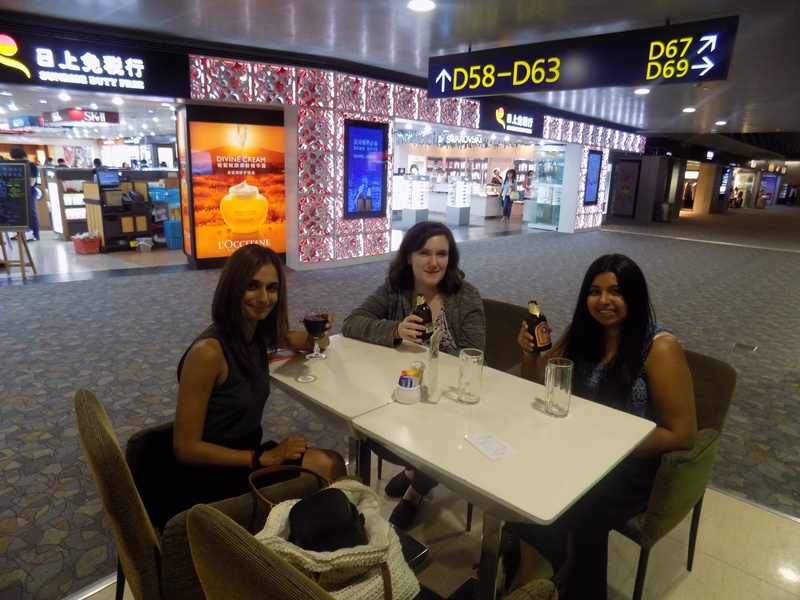 Pri and I said goodbye to our new Beijing friend Fiona, exchanged WeChat’s and went home to get some rest. The next morning I would get the bus to Guangdong, Foshan with Pri and spend a night there to see her part of China. Hong Kong had been truly amazing, literally a beautiful, intriguing mixture of Chinese and British influence. I plan to return again next year and complete the list!